QUESTION: WHAT DO you get when you cross a keyboard with a sequencer and a sampler? Answer: a workstation. At least, this is Roland's latest angle on the workstation ethos. The company have already produced a synth-based workstation in the form of the D20, which ended up being undercut by the company's own D10 synth (essentially a sequencer-less version of the D20), which says a lot for the popularity of the workstation approach. Similarly, Korg's M1 Music Workstation has sold on the strength of its impressive synthesis abilities rather than any real claims to workstation fame. Against this background, how will the W30 fare? Well, for one thing it has a much more powerful and flexible sequencer built into it, which is based on the company's existing MC300/MC500 hardware sequencers. For another thing, Roland claim that a sampler offers greater flexibility than a synth as the sonic basis of a workstation, as it's easier to sample synth sounds than it is to synthesise acoustic sounds. Broadly speaking this is true, though with synths like the M1 and Ensoniq's new VFX offering samples as the basis of synthesis (and the M1 even allowing you to access new samples via plug-in ROM cards), there's a gradual blurring of distinctions going on. However, it's worth pointing out that the W30 includes digital filtering and resonance, with the filter cutoff point controllable from a separate eight-stage filter envelope. If you start with a sampled sawtooth waveform, haven't you effectively got a traditionally-styled synth at your disposal? At the same time, as we all know, there are things you can do with a sampler that you can't do with a synth. Roland could well have a point after all. AS WITH ROLAND'S S50, S550 and S330 samplers (to which the W30 is intimately related), the new sampler loads its operating system off a 3.5" DSDD System disk (v1.00 as of review) when you switch on the power; if the System disk isn't in the drive, you'll be prompted via the instrument's LCD screen to put it there. It takes 30 seconds for the W30 to become functional, after which time you shouldn't remove the System disk unless you want to load up existing sequences and samples. Why? Because the W30 needs to refer to the System disk whenever you select the sampling page or a sequence- or sample-editing routine (known as a Utility), as each routine overwrites the previously-selected one in memory. This is par for the course with Roland's samplers, but although each load only takes a few seconds it's still an irritation. On the other hand, this approach has the benefit of making the W30 open-ended, as new Utilities can easily be added in any future updates. 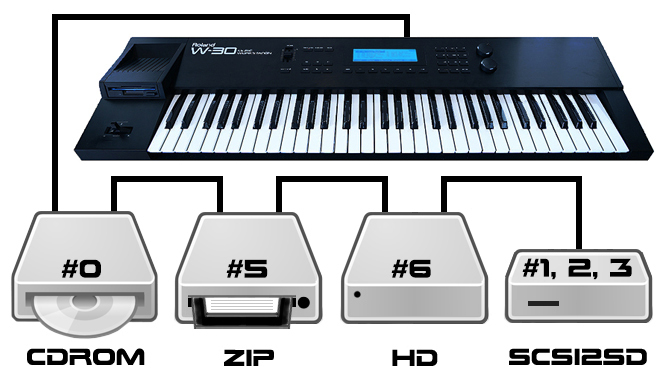 The W30 has been given a five-octave attack velocity and channel aftertouch keyboard, which has a shallow travel and a very comfortable combination of resistance and bounciness. The new workstation has three modes: Performance, Sequencer and Sound. Each of these is accessed by pressing a dedicated front-panel button. Performance mode is the most straightforward (I'll come to the others later), and the one you should be in if you want to play any one of the Patches without regard to sequencing. However, this being an integrated system, you can play the current sequence from within this mode, and even fast forward or rewind to any position in the sequence (the sequence's status and position are indicated in the top right-hand corner of the LCD window). You can scroll through a list of the Patches, and set an output level (0-127), octave transposition (+/-), audio output assignment (1-8 or Tone) and bend range (0-12 in semitone steps) for each Patch. Additionally, in this mode you can set the master tuning along with System configurations isuch as the routing of internal and MIDI data (which I'll discuss later under "sequencing"), MIDI sync transmission on/off and functions of the W30's footswitch and pedal inputs. These configurations can be saved to the System disk ..c and automatically loaded when you power up the W30. The new workstation's front panel has a sleek, uncluttered appearance which is fast becoming a Roland style. The low-profile buttons divide into four functions: mode selection, sequencer operation, page selection and numeric/character keypad, while the single slider handles volume. As with Roland's A50 and A80 MIDI controller keyboards, the W30 employs a generous 8X40-character backlit LCD screen with adjustable contrast. I found it both easy to read and easy on the eyes, and of course for operating purposes it's a massive improvement on the measly one- or two-line LCD windows we've had to put up with for so long. Finding your way around the display and editing the parameters are accomplished by two infinite rotary dials labelled "cursor" and "value" respectively, while you can also type in numerical parameter values directly using the keypad (a blessing when you're dealing with the large numbers that inevitably crop up with sampling). Also, as on the A50/A80, Roland have adopted a system of five "soft" buttons, located immediately below the screen, which take on different functions depending on what page or window you're on. These functions are indicated along the bottom row of the screen, making it easy to find your way around the W30's features. Successive presses of the Exit button to the right of the soft buttons takes you back "up" through the pages until you reach the initial page of the current mode. Easy though this might be, the W30 has 62 LCD "pages" (not to mention countless more windows within these pages), and moving around them all can get a bit laborious. Wouldn't it be nice if you could move directly to certain often-used pages? It would, and you can. When you press the User button, a scrollable list of the 62 pages appears in the LCD screen and each of the five soft buttons has a page number associated with it; pressing the relevant soft button takes you directly to its page. You can assign any one of the 62 pages to each soft button, while the currently-selected page can be jumped to by pressing the Enter button. Assigning five of your most commonly used pages to the soft buttons can be a great timesaver. On the W30's rear panel you'll find MIDI In, Out and Thru sockets; mono sample input with a gain knob for adjusting input level; one footswitch and one footpedal input; eight individual audio outputs (with output one alternatively functioning as a mono mix output if required); a mono headphone socket which outputs the same signal as individual output one; a contrast adjust knob for the front-panel LCD window; and a (covered) SCSI port for connecting up a hard disk and/or Roland's CD5 CD ROM player (reviewed in MT, May 89). To make the SCSI ("scuzzy") connection you'll need the optional KW30 upgrade kit, which unfortunately will set you back a further £135. What are the advantages of getting connected? Well, a hard disk provides far greater storage capacity and greater convenience than floppy disk, plus faster loading times, while the CD5 CD ROM player offers you ready access to a vast (and still growing) library of samples. These aren't cheap options, but at least the upgrade path is there, should you want to take it at some stage. BEFORE YOU EVEN consider sampling your own sounds, the W30 can take advantage of the vast library of samples which already exists for Roland's S50, S550 and S330 samplers. For reviewing purposes Roland provided a good selection of S50 and S550/S330 disks to try out, and I can report that not only did they all load without a hitch, they demonstrated that if you buy a W30 you'll have potential access to a healthy variety of instrumental sounds, many of which are of very high quality. Incidentally, W30 sound data can be saved in S50 and S330/S550 disk formats for use in these samplers, though some features of the W30 will be lost in the translation. But there's another reason why you don't have to start sampling straight away. In addition to its 512K word of RAM sample memory, the W30 has 512K of ROM sample memory containing some 70 samples. These offer a healthy number and range of drum and percussion samples, plus a variety of bass sounds (too many, perhaps), electric piano and a number of sounds which obviously originated in the synthesised domain (strings, brass, sawtooth, pulse). One of these Tone samples can be selected as part of a Tone (that is, with associated filter, LFO and amplitude parameters), and Tones in turn can be mapped across the keyboard to form a Patch (again with associated parameters such as key mode, velocity-switch threshold, bend range and aftertouch response). In addition to the operating software, the System disk contains data for 128 Tones and 32 Patches specifically crafted for use with the internal ROM Tones (samples); these are listed on a chart which accompanies the manual. When you power up the W30, the first 64 Tones are loaded into Tones 33-96, and the first 16 Patches into the 16 internal Patch memories, along with Function data defining the eight Parts and MIDI data defining the MIDI receive options for each Part. The other Tones and Patches can subsequently be loaded individually into the W30. In this way you have a library of sampled sounds at your disposal straight from power-up. Incidentally, you also get three Sound and Song disks with the W30, which not only show off its abilities via pre-recorded sequences but also give you some more samples to start out with (in RAM, this time), among them acoustic piano and acoustic guitar. The other advantage of the ROM approach is that you can use the ROM sounds to give yourself, say, a drum, bass, electric piano and synth strings grouping and still have the entire RAM sample memory free for your own samples. On the other hand, if you end up tiring of the ROM samples, or don't have any interest in them in the first place, you might wish that that 512Kword of ROM had been RAM instead. The W30's sampler section (minus the ROM side of things) is essentially the company's S330 sampler in a different box, and of course given the benefit of a large, clear and informative LCD screen. The 5l2Kword of RAM memory is divided into two Banks, giving you 2X7.2 seconds of sample time at the maximum sample rate of 30kHz (you can't sample across the Bank boundaries). The only other sample rate is 15kHz (for 2X14.4 seconds), which might seem like a shortcoming when you're trying to offset sample quality against sample time, but the difference in quality between the two sample rates is less you might imagine, and quite often you can get away with the lower rate unless you're obsessed with cleanness. Of course, samples of both rates can be combined. The RAM memory allows you to create up to 32 Tones. One limitation to watch out for is the fact that samples have to be in multiples of 0.4 seconds (30kHz) or 0.8 seconds (15kHz), which can be wasteful on space. Although sampling resolution is 12-bit, Roland's use of fixed-rate sample playback and differential interpolation ensures a quality of sound which is closer to 16-bit. Sampling is straightforward: you select sample number, Bank, sample rate, sample time, original key and, if necessary, a pre-trigger time of up to 100 milliseconds (invaluable for catching -sharp attacks). Then you set a threshold level with reference to the displayed input signal level and select auto, manual or previous sampling as appropriate. If required, you can then loop the sample by setting loop and end points, and call auto-looping and smoothing into play to help you out - though in practice these are no instant panacea for any looping problems you might be having.